Further to my previous post on Holwood, I’ve included a sketch map (early 20th century) of Keston, Kent covering the area of the Holwood estate. 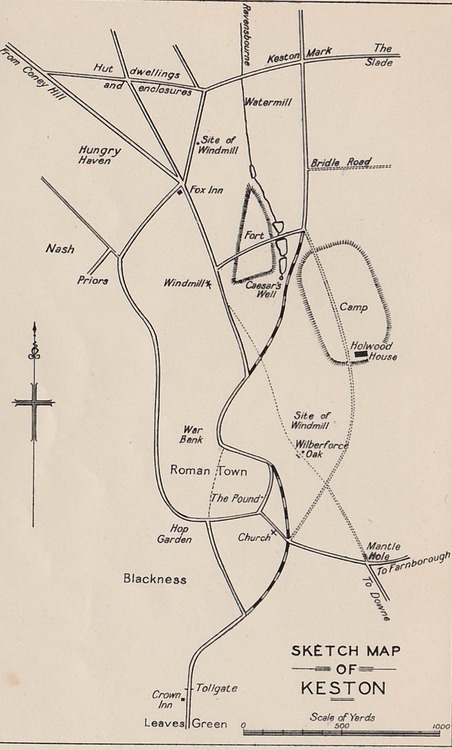 This map can be found at the beginning of Frederick Sidney Gammon’s 1934 book The Story of Keston in Kent. The dotted line running down next to the Wilberforce Oak was the original road to Westerham which Pitt had diverted in 1790. The location of Holwood House on the map above is different from where Pitt’s Holwood stood, it being on the left-hand side of the Camp rather than on the right (see Gammon, 1934: 51). For those interested in visiting Keston, the Fox Inn is still there, and does excellent pub lunches! Keston is an attractive place, and I can well imagine Pitt going birds-nesting there as a child, and wanting to call Holwood his own (Gammon, 1934: 26). Gammon, F.S. (1934) The Story of Keston in Kent. London: Thomas Murby & Co., pp. 26, 51.